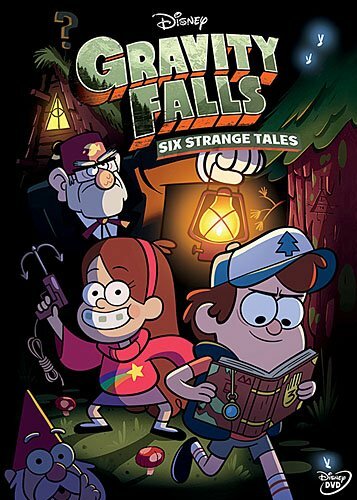 Gravity Falls: Six Strange Tales features the first six episodes of the first season of Gravity Falls, a fun light-hearted show about two kids living in a town where weird stuff happens constantly. The town is Gravity Falls, Oregon, and the two kids are fraternal twins, brother Dipper and sister Mabel. Together they live with their great uncle Stan, whom they call Grunkle Stan in his Mystery Shack, which is itself is a museum of oddities. In the first episode Dipper finds a book hidden in the forest which documents all the weird stuff in Gravity Falls, and this book proves crucial to helping the twins figure out the mysteries they encounter throughout the series. The show definitely has some weirdness to it, such as a bunch of gnomes standing on each other dressed up pretending to be a person or wax figures that come to life or Dipper making a ton of copies of himself. I'd say it's kinda similar to Regular Show, but it really does have a different tone to it. Regular Show feels like it's more for adults and Gravity Falls feels like it's more for children. That's not to say grownups wouldn't like Gravity Falls as I thought it was fairly enjoyable. The characters are fun with grumpy conman Grunkle Stan always trying to make a buck, Mabel with her outgoing and silly personality, and Dipper and his constant desire to explorer and uncover mysteries. Then there's also Soos the handyman who is like a clumsy man-child yet seems to have many talents that come in handy, and teenage tomboy Wendy who works part time at the Mystery Shack and whom Dipper has a crush on. I think the show is perfect for kids and yet still enjoyable for adults, which isn't something you come across every day. As I said earlier, this DVD release only includes the first six episodes of the first season, which is kinda disappointing. I would have preferred a release with the entire first season. But it does includes a free Mystery Book Journal like the one Dipper finds in the show, so I thought that was a cool pack in. Unfortunately there were no extra features on the disc, so that was also a bit disappointing. So, should you get it? Well, I would say wait until they release the entire season but who knows when or if that'll even happen. And if you rent it then you won't get the free Mystery Book Journal. So I don't know. Guess I'll just have to leave this one up to you.